The Gran Chaco is a rugged, semi-arid, lowland forest region that spans 250,000 square miles across Argentina, Bolivia, Brazil and Paraguay — an area nearly the size of the U.S. state of Texas. In Paraguay the Chaco covers the entire northern half of the country. These hinterlands host some of the hottest temperatures and harshest living conditions in South America. Despite this intimidating backdrop, the Chaco is a cultural hotspot and is the traditional home to over 25 indigenous groups. These groups seek to maintain their communities and cultural identities, but in recent years they have faced daunting challenges posed by mining and large-scale deforestation caused by the rapid encroachment of cattle ranching, commodity farming and other economic activities. Many of us who have worked in the Chaco over the years have long purchased the beautiful handicrafts produced there. Just about every nook and cranny of my office is filled with them. On one of my many trips to Filadelfia in the Paraguayan Chaco, I attended the inauguration of the Centro de Artesanías, a large building filled with crafts by artisans from all over the Chaco. There I started doing what I do best — buying handicrafts! But after a while it became clear that these small gestures of solidarity to support the artisans were not enough. The indigenous artisans wanted to fully develop the Centro’s potential and move forward with the production and marketing of crafts together with the private and public sector partners that could help make that happen. This was the spark for an IAF project and what led the organization I work for, the Mingarã Asociación para el Desarrollo Sustentable, to become an Inter-American Foundation grantee partner. Mingarã provides training and technical assistance to eight organizations of indigenous artisans in the Chaco to improve handicraft production and marketing in order to generate income, to promote public awareness and recognition of Paraguay’s indigenous heritage, and to create opportunities for tourism growth. 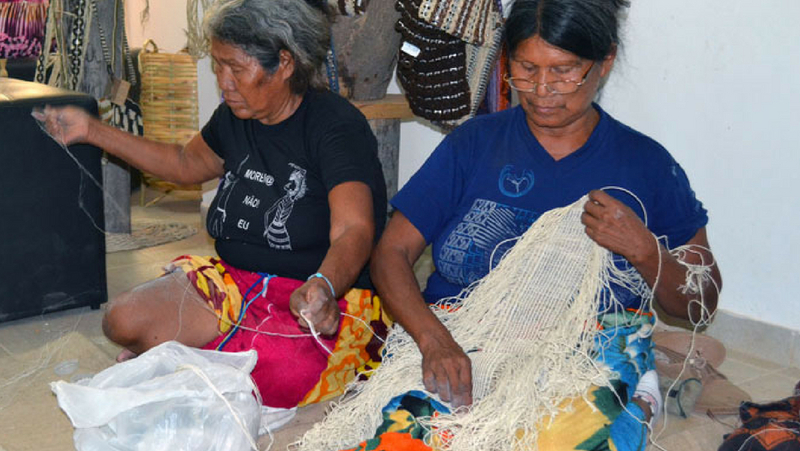 Mingarã also facilitates dialogue among artisans of various ethnic groups, civil society organizations, and the public sector on how to best value and promote the traditional craftsmanship of indigenous communities for sustainable development and to improve their quality of life. The IAF project has had a definite impact over its two years. It directly benefited over 300 people and benefited another 1,500 people indirectly. The project provided critical training to artisans — especially women — and helped raise their incomes. It also increased the visibility and the potential of the Centro de Artesanías del Gran Chaco. Today the Centro is not only a tourist attraction and a place to buy handicrafts, it is also the focus point for cultural exchange and cooperation among indigenous groups and public and private entities involved in promoting handicrafts and tourism in the Chaco. In addition the project helped establish additional locations for the sale of the artisans’ handicrafts at the headquarters of the National Tourism Department (Secretaria Nacional de Turismo – SENATUR) in downtown Asunción, the country’s capital. This further increased sales and fostered recognition of the cultural and economic value of these crafts on a national level — a virtuous circle that helps unite the Chaco’s indigenous artisans and improve their quality of life.